Emergency Response Service is a consulting service. Once a ship’s owner/operator has signed ERS agreement with a classification society, and an ERS database has established containing information on stability and structural strength of the relevant ship, a permanent shore-based emergency response system of the society will be actuated quickly upon the application of the ship’s owner/operator in case of an accident, e.g., collision, grounding and oil spillage, etc. The ERS database will be accessed and damage stability, residual strength and oil spillage will be calculated and analyzed as required by the ship’s owner/operator. In this way, technical solutions are provided to the master/ ship’s owner/operator, which assist them in making the final decision to rescue the ship in distress. In emergency, the optimum action of rescuing the crew and cargo, protecting the environment is not noticeable. For the water flooding and oil spillage caused by collision, grounding, fire, explosion or bad weather, the matter will be worse if not handled properly. In the sea, the crew and the manager need accurate information to reduce the consequence of the accident as soon as possible. In this case, a comprehensive assessment of the ship’s stability and longitudinal strength is necessary. ERS is established for providing this technical support 24 hours everyday. 6.Solutions on how to maintain the minimum stability and ensure strength safety in case of an accident. 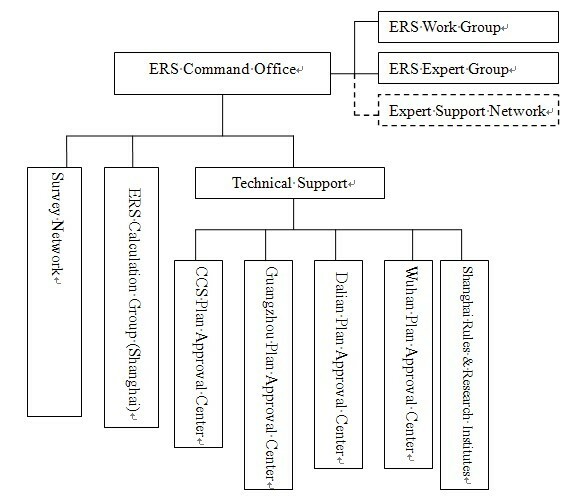 The organization of implementing ERS includes ERS Command Office, ERS Work Group, ERS Expert Group, Expert Support Network, ERS Calculation Group (Shanghai), Technical Support (Shanghai Rules & Research Institutes, CCS Plan Approval Center, Guangzhou Plan Approval Center, Dalian Plan Approval Center and Wuhan Plan Approval Center) and Survey Network. 1. MARPOL Annex I, Ch.5, Reg.37(4): All oil tankers of 5,000 tonnes deadweight or more shall have prompt access to computerized shore-based damage stability and residual structural strength calculation programs. 2. The related requirements of the United States of America. 3. The related requirements of the Government of The People's Republic of China. 1. The ship’s owner/operator submits “LETTER OF INTENT FOR EMERGENCY RESPONSE SERVICE” (Annex 1) directly to Classed Ship in Service Department. The date of the ship such as name, flag, length etc. should be credible. 2. When CCS and the ship’s owner/operator agree with the details of the agreement, Classed Ship in Service Department will be in charge of or authorize the organizations to sign the formal agreement with the ship’s owner/operator(Annex 2) . 3. The ship’s owner/operator should provide specific plans for modeling the database. Please see (Annex 3). 4. CCS will provideand < Emergency Manual for Emergency Response Service> to the ship's owner/operator. 5. CCS will provide training for the ship’s owner/operator if he wants to familiar with the procedure of ERS. 6. If the ship’s owner/operator wants to terminate ERS, please submits "LETTER OF TERMINATION FOR EMERGENCY RESPONSE SERVICE" (Annex 4) directly to Classed Ship in Service Department. If you have any question and request and suggestion, please contact us.